The MRS Conference Proceedings Series includes volumes from important scientific and technical meetings sponsored by organizations other than the Materials Research Society which also offer an interdisciplinary approach to materials science. 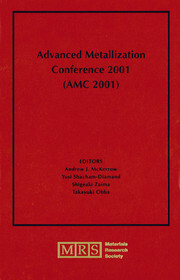 All volumes contain subject and author indexes and are available only in print format. MRS also publishes the MRS Symposium Proceedings Series. This long-standing standard reference includes papers presented at MRS symposia and covers the full spectrum of materials science areas. Visit www.cambridge.org/us/mrsproceedings for details.